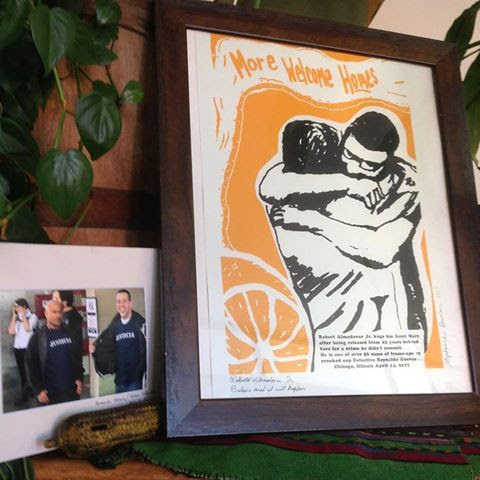 The poster Stephanie created and a photo of two of the prisoners who were released with all charges dropped. There have been at least 7 others whose charges have been dropped since this past April. Stephanie Weiner, a student in Printing for the People, has been actively working for over ten years with Comite Exigimos Justicia (an activist group in Pilsen) towards the release of 51 prisoners who were wrongfully convicted by a CPD detective. BuzzFeed News published an investigative piece this past April that led to the release of a man, Roberto Almodavar Jr., who had been sentenced to life and served 23 years. You can see a picture of Stephanie featured at the photo banner at the top of the article! Last spring, Stephanie created a poster in Printing For the People at HPAC that has since become the visual emblem of the protest against this series of wrongful convictions. The poster bears the slogan “More Welcome Homes.” Upon his release, Almodavar signed several of the posters to be distributed to the activists who had been fighting for his charges to be dropped. Recently, The Center for the Study of Political Graphics contacted Stephanie and asked to include her work in an upcoming traveling exhibition AND to add her print to their collection of posters against police brutality. Their collection is impressive and vast and includes posters by the Guerilla Girls, Barbara Kruger, and more! 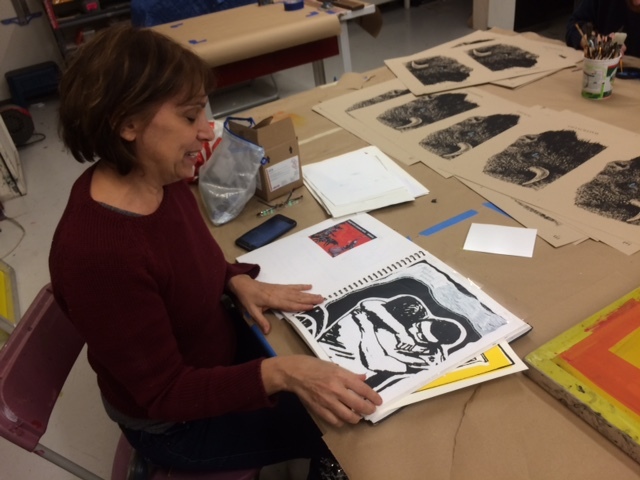 Stephanie with some of the preparatory sketches that she made in class at HPAC, under the brilliant guidance of teaching artist, Aaron Hughes.